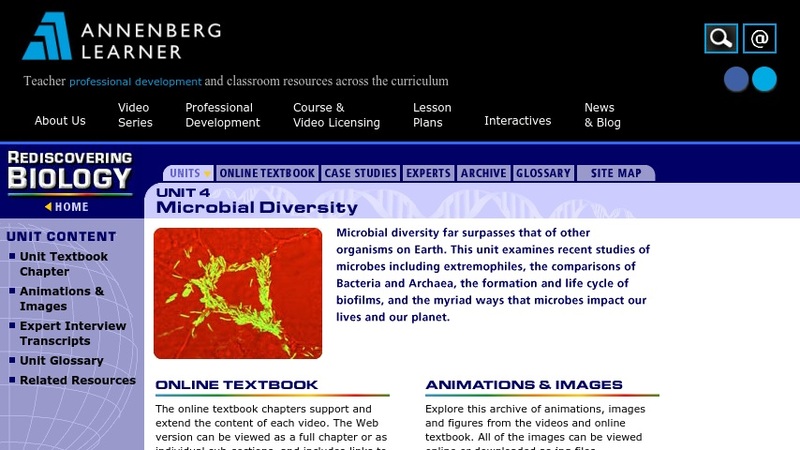 This page is the jumping-off point for an educational unit on microbial diversity. There are links to a course outline and classroom activity worksheets, a 30-minute video, an online textbook chapter, images and animations that supplement the chapter, transcripts of interviews with five experts featured in the video, and a glossary and bibliography. The video and chapter cover the three domains (archaea, bacteria, eukaryotes), methods of studying the tree of life, the diversity of microbial metabolic systems, biofilms, and the role of microbes in global carbon and nitrogen cycling and human health. The course outline provides a structure for incorporating the video, the textbook chapter, and four classroom activities into a 2hr session appropriate for high school or undergraduate students.